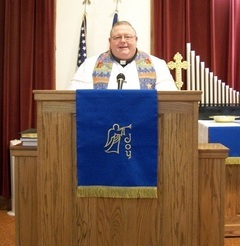 Pastor Dan is a native Nebraskan, born in Wakefield on December 14, 1954. He grew up in Emerson and Lincoln, NE. He attended Bethany Lutheran College in Mankato, Minnesota where he received his Associate of Arts Degree. He then attended Minnesota State University at Mankato where he received a degree in Psychology and a minor in Sociology. He then entered Bethany Lutheran Theological Seminary of the Evangelical Lutheran Synod where he received a Candidate of Theology (Masters of Divinity) degree. He was ordained into the holy ministry of the Lutheran Church August 28, 1988. He received his Doctor of Philosophy degree in July of 2010, and subsequently was awarded a life membership in the Epsilon Kappa Lambda Society for Academic Achievement. His doctoral dissertation on Holy Baptism can be viewed on our website. During his ministry, he has served congregations in the following locations: Princeton, MN (vicar), several congregations in Australia, two congregations in metro Atlanta, GA, and currently Mighty Fortress in Seward, NE since May of 2004. He also served as the President of the Evangelical Lutheran Synod of Australia for several years. Pastor Dan is a commissioned chaplain for the Lincoln Police and Lincoln Fire Rescue Departments, serving in this capacity since May of 1999. He was formerly employed by Lancaster County as a member of the Lancaster County Mental Health Board, retiring from this position in December of 2011.